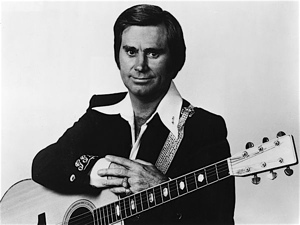 George Jones is a hard man to kill. It took 81 years of heartbreak and hard drinking to put him down, but Friday in Nashville he left this mortal world. This has to give guys like Keith Richards, Neil Young, Willie Nelson, and all the other high functioning mutants out there pause. The train ride, eventually, will come to an end. Jones was the epitome of a country singer. He lived his songs first person, putting himself in the crosshairs of tragedy and despair with his drinking, drug use, and divorces. He may have been a mess, but Jones wasn’t boring, and along the way he became the voice of country music for better than 40 years. His distinctive baritone styling and use of pacing in his storytelling created a sense of suspense in his singing. Fans hung on every syllable listening for the quiver in his voice to get a sense of how bad the circumstances were about to get. Ballads and duets became his specialty. Yet it didn’t matter whom he was singing with or how many were in the crowd, Jones always kept a sense of private turmoil about himself. It didn’t matter if it was a rollicking Saturday night or his records were selling well – Jones knew his personal demons were waiting for him once the spotlight dimmed. He was born in the oil field town of Saratoga, Texas in 1931, and started playing guitar by nine. His father tended to be a violent alcoholic. He bought Jones his first guitar for his 11th birthday, and would beat the boy if he didn’t sing for his drinking buddies. Jones quit school in the seventh grade and began singing gospel songs on the streets of Port Arthur, Texas. After leaving home at 16, Jones married Dorothy Bonvillion at 17, producing a daughter, but was divorced before her birth. Jones began his music career in 1954, after being discharged from the Marines. He got married that same year to Shirley Corley, and within two years he was singing at the Grand Ole Opry, but his No. 1 hit “White Lightning,” in 1959, let everyone know Jones was drinking with vigor. There was a Grammy Award nomination in 1962 for one of his signature recordings, “She Thinks I Still Care,” and another lasting hit with “The Race Is On,” in 1964. For whatever reason country stars always want to open theme parks, and Jones was no exception. In 1966 the George Jones Rhythm Ranch opened in Vidor, Texas, near his home. He played there once then disappeared for a month on a drinking binge. It got so bad Corley hid the keys to all his cars, trying to make it physically impossible for him to travel to Beaumont, located 8 miles away, and buy liquor. Jones wouldn’t walk that far, but Corley failed to hide the keys to the lawn mower. With a part in his hair sharp enough to slice paper, Jones had a distinctive look that never required he wear a cowboy hat. There was an authenticity in his eyes, and that knowing smile of the mischief he committed. He was nicknamed Possum, for his close-set eyes and pointed nose, and even opened a nightclub in Nashville named Possum Holler – it lasted but a few weeks. 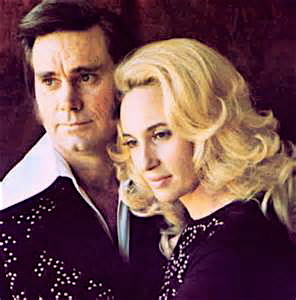 Mr. and Mrs. Country Music, George Jones and Tammy Wynette. It was in Nashville he met and fell in love with Tammy Wynette, who also was married at the time, to a man that wrote songs for both her and Jones. There was another divorce (1968), and he married Wynette in 1969, starting a turbulent, long-lasting personal and professional relationship. They were “Mr. and Mrs. Country Music” to the world, it was even painted on their tour bus, but the marriage was troubled behind the scenes with all of Jones’s drinking and amphetamine use. After the couple divorced in 1975, Jones’s behavior grew more erratic. He began using cocaine and brandishing a gun. At one point he ventilated his tour bus by emptying a pistol into its floor. His other nickname, “No-Show Jones,” began circulating nationwide. In 1979 he missed 54 concert dates because he couldn’t put the bottle down. As his troubles increased so did his fame. By 1979 he had moved to Florence, Ala., partly to get away from arrest warrants for nonpayment of child support. He had a girlfriend there from 1975 to 1981, and when they broke up she sued and won a divorce settlement under Alabama’s common-law marriage statutes. His biggest hit came in 1980, with “He Stopped Loving Her Today.” It reached No. 1 on the country charts. The Country Music Association named it song of the year, and it won the Grammy for best male country performance. This was a resurgence for Jones. He recorded heavily in the early 1980s and married for a fourth time, to Nancy Sepulvedo in 1983, who he stayed with till his death. During this period he gave up the drugs and alcohol and straightened out his business affairs. By 1988 “New Country” was taking hold, and Jones was relegated to elder statesman status. He was sought out for duets with the younger, more image-conscious performers. After being inducted into the Country Music Hall of Fame in 1992, two years later Jones had triple-bypass surgery. It didn’t slow him much, as he reunited with Wynette that same year to record the album “One.” They toured for two years, and then Wynette died in 1996 at the age of 55. At this point Jones was performing more than 150 nights a year, but on March 6, 1999, he was critically injured when his SUV crashed into a bridge abutment while talking on his cell phone and changing a cassette tape. He suffered a collapsed lung and ruptured liver. A half-empty bottle of vodka was found in the car. He bounced back after treatment and recorded “Choices,” in 1999, that won a Grammy for best male country vocal. Jones continued singing well into the 21st Century. In 2008 he was a Kennedy Center honoree, and in 2012 he received a Grammy Award for lifetime achievement. George Jones lived a rich life. Sure there was plenty of pain and regret, but he played to the strengths he was given, and tried to balance his passions opposite his demons. He didn’t run from any of it or try to hide. He lived it right out there in the open for all of us to see, and you can’t fault a man for that. This entry was posted in Music and tagged George Jones, Tammy Wynette. Bookmark the permalink.